The Information Sciences CRAI Library provides comprehensive materials for study and research activities at the Faculty for the courses: Information and Documentation, and Audiovisual Communication. 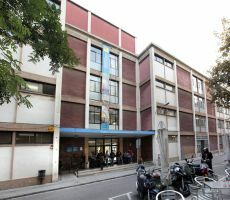 The Information Sciences CRAI Library was founded in 1920 as the library of the Escola Superior de Bibliotecàries, the former school of library science created by the Catalan Mancomunitat in 1915. As the first specialized library of its type in Spain, its collections include the most representative twentieth-century publications in the field. Photographs of the School of Librarians Collection that included photographs of the former Escola de Bibliotecàries since its creation in 1915 until the early years of the century. The collection has been collected and described by Assumpció Estivill. Printing, Publishing and Bookselling Catalogs (UB Digital Heritage Library). TRIAde is a bulletin prepared by the Information Sciences CRAI Library that contains recommendations for people associated with these professional areas on reading, services and resources of interest in the field. TRIAde can be found in CRAI Libraries. You can find the bulletins at the UB Digital Repository or Issuu. The Aula Jordi Rubió i Balaguer seminars which have been organized by the Faculty of Library and Information Science since academic year 2007-2008, are a tool for reflection on the field of information science and documentation. For these seminars, the CRAI Informations Sciences Library draws up reading guides that can be found at the UB Digital Repository or Issuu. The Reading guides are publications dedicated to issues related to Information and Communication and destined to spread the Library collection. Their publication coincides with a featured event (Sant Jordi, Day of Libraries, Christmas, the end of the academic year, etc.) Each guide is about an issue and it offers a bibliographic selection, articles and other resources. You can see the reading guides at Dipòsit Digital de la UB or Issuu. The Recommended bibliography is a biannual publication that includes monographs recommended for teachers of first course subjects of the degrees of Information and Documentation and Audiovisual Communication. It’s published at the beginning of each semester to facilitate the access and loans at the first level students and to improve their knowledge about the Library services. You can see the Recommended bibliography at our Issuu. Films from the bachilor's degree in Audiovisual Communication, in the CRAI catalog. Del On the Information Sciences CRAI Library, inIssuu (weekly bulletins) and in the Catalog. Study rooms: 1 (with a capacity for 6 people). Reserve the room.